On Thursday, Scrollstream were lucky enough to be given the chance to show off a proposed scroll for the Decay resource deck, Wicked Being. I say proposed as the purpose for showing it was to see the reaction of players to the scroll and to ask how they thought it can be improved. The sticking point was that this was previously announced as being a purposely 'Bad' scroll, which has caused a lot of consternation given the belief that a) there should be no purposely bad scrolls and b) there arent enough scrolls to justify spending important development time on one that is. Unfortunately there appears to be, for some, a misconception of how a game like Scrolls is structured. Some players enjoy discovering good “bad” cards. The natural first step of any game is to create a path of trial and error for new players who haven't found their playing style yet, and also allow more experienced players, through playtesting, to discover the good scrolls and how to put them together into a viable deck which they enjoy playing. After all, it is a game and enjoyment is the main goal. For example, preconstructed decks are criticised for not being strong enough to be used at even the lowest levels of ranked play. They do, however, serve as an excellent guide to a resource type's primary characteristics and are powerful enough to complete at least the easy, single player, trials. 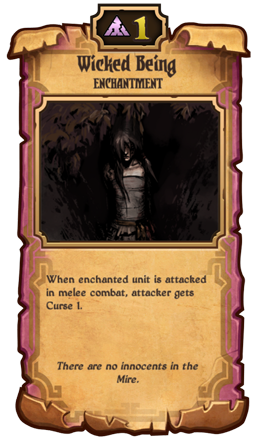 This gives a new player both a fundamental understanding of the game and enough gold to purchase more scrolls to strengthen their deck. Other points to consider are that a CCG whose scroll are all equally powered would necessitate each iteration of scrolls to be more powerful than the last, to the point that it could spiral out of control. Also types of play such as draft wouldnt be as much fun as the 'bad' cards create the excitement. The second issue, there aren't enough scrolls to justify bad ones, ignores that they have to be present from a design standpoint and that the act of discovery must begin from the point the game is created. Does this then create a specific deck that everybody will eventually discover and play? Well no, as scrolls `only` has approximately 45 in each of the 4 factions (in comparison to the number that established games, like MTG, started off with) and there are still numerous deck builds out there. If there was an error it's perhaps that Wicked Being was announced as a 'bad scroll' from the start. It's kinda like putting up dead end signs in a maze. But this might be a symptom of something else, the fact that Mojang are exceptionally open in how they communicate with their community. I would rather that occasional slips, if it could be called that, happen than we hear almost nothing from them at all. It's also important that people remember that this game is in beta and the bad scroll concept is a recognised phenomena in CCG`s, so a developer making reference to this isn't so shocking. With so many people asking for increased input into the development of Scrolls, perhaps not as many want the 'wizard's curtain' to be pulled back as they first thought? Last edited by SeeMeScrollin on August 20th, 2013, 16:07, edited 2 times in total. This feels like such a cop out to me. Why does the learning process have to be, "Hey, see this card? This card is awful. Never use this card." Why can't it instead be, "This card could work in another deck but it's not working in mine, let's try something else instead." I never played a TCG before Scrolls and even I recognized that half of my precon was awful. I never once thought cards like Faith Blessing would ever be good. So I just grinded gold and bought the competitive cards, and my deck ended up being like every other Order deck being played in ranked (out of my own intuition). I don't like the black and white design principle of "these few cards will be great and playable on a competitive level, these other majority of cards will be designed to be bad. Because new players need to learn that bad cards exist." A better design principle would be to attempt to make all cards at least somewhat competitive. Obviously with the confines of 50 cards to a deck, not every card is going to be played, but this would open up the possibility to try new things and maybe have a less stagnant meta game, where you constantly play against 1 of 2-3 deck compositions. This fits some of the lesser utilized cards, but not all of them. I'm part of the Scrolls draft group and have played limited matches more than most people. Some cards are indeed amazing in draft and unplayed competitively (like Charge Coil, since there's less of a risk of Quake). However, there is no playing style that incorporates cards like Rigged besides the "I want to lose all my matches" playing style. If a card is unplayable in draft, it should probably be looked at again. Yes and no. A better example of this is Nutrition. I felt this card had unrealized potential, and now Decay is coming out and this card will probably be in most decks as long as Puppet Soldier is not altered. I agree with this point and I think there are a small amount of cards that fit this category (especially if some sort of anti-Quake card is released, that card destroys the viability of a few good cards like Charge Coil). There are still a lot of unplayable cards that won't be saved by new cards. Well, maybe, maybe not. It depends on your stance as to whether implementing completely unplayable cards in a game that lacks cards in the first place is "goofing up." Making purposefully “bad” scrolls is pointless in my opinion. I agree that “bad” scrolls tend to arise but that should not be the initial thought process/intention when a scroll is being made. “Bad” scrolls are bound to arise due to other scrolls negating the usefulness of a particular scroll, but every scroll should have (at some point in its existence) a level of playability. That being said this particular scroll I can see a few things that can be done with it. Waking stones comes to mind but back to the point though. Making purposefully “bad” scrolls in an attempt to bloat the card library is bad practice imho. This. I completely agree. If Wicked Being at least gave Curse 2 (or even - Curse 3! ), it still wouldn't be competetive, but would have its time to shine. And it's even worse when I see a scroll that could be a good one if it got some kind of fix. Look at the Infected Gravelock. If not for "Move 0" rule, it could be a great scroll, and semi-worth splashing for in dedicated Gravelock decks. But with that - it is just another bad scroll. If it's a card that needs to be filling some niche in the game (like not enough Gravelocks), then making it purposefully bad (especially when Gravelock decks are not even competetive) is a horrible move. If 2/2/3 with a poison for 2 is too much, you can make it 2/2/2, and not change it into a poisonable structure! As an Energy player, I cry a little inside every time I see Iron Ogre. It's a card that could be good in the same way the Mangonels are good. It could be awesome in the Order deck, played together with Speed and/or getting help from Honorable General. But it's in Energy and with its stats and everything - even though it technically is "the strongest" creature - is still crappy, since it has zero synergy with pretty much anything. The Gravelocks don't have synergy with Bombard, but they at least benefit from Elders and can be somewhat useful with Fury; the Iron Ogre doesn't get those perks. I really hope that one day... one day it will gets its time to shine. Great post Obviously "bad" really depends on your viewpoint. As you progress through the rating system you see some cards used less and less. Obelisk for example is a cheap waking stones for newer players to use as a crutch. The scroll vengeance veil was not used much (it probably isn't now) but cards that may not have an obvious advantage are what gives the ability to learn "secret" combo's, and now that poison and other DoT cards (e.g. faith duty) are in the game, the card has some uses which could make a deck. but would have its time to shine.